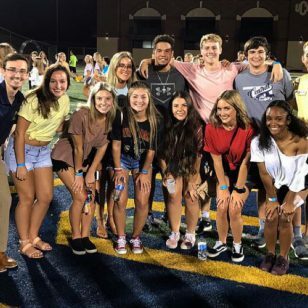 Uprooting your life to move to another country is imaginably difficult for a 17-year-old from San Luis Potosi, Mexico, and yet, for Victor Acosta, a University of Central Oklahoma alumnus, this became his reality. On his 17th birthday, Acosta moved from Mexico to the United States with his family, in the hope of finding a better life. But as he began looking for universities, after graduating from Santa Fe South Charter High School in Oklahoma City, he quickly realized the hard path he had ahead of him. Acosta was not eligible for financial aid or state help, so paying for college would fall solely on his shoulders. 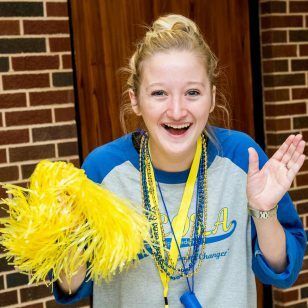 Acosta researched a variety of universities before deciding on UCO. He felt at home when he toured the campus, and after discovering the graphic design program in Central’s College of Fine Arts and Design, he was sold and never looked back. 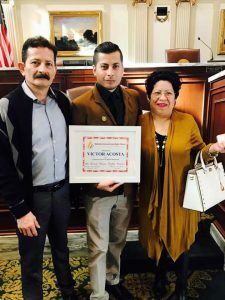 It was a difficult road, but with the support of UCO faculty, his family and his friends, Acosta graduated in 2014 with a bachelor’s degree. 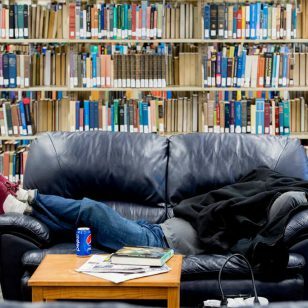 “Going through college was difficult for me. I didn’t have a Mac computer like everyone else, I didn’t have the latest and greatest technology, and the language barrier made it tough to do presentations,” Acosta said. 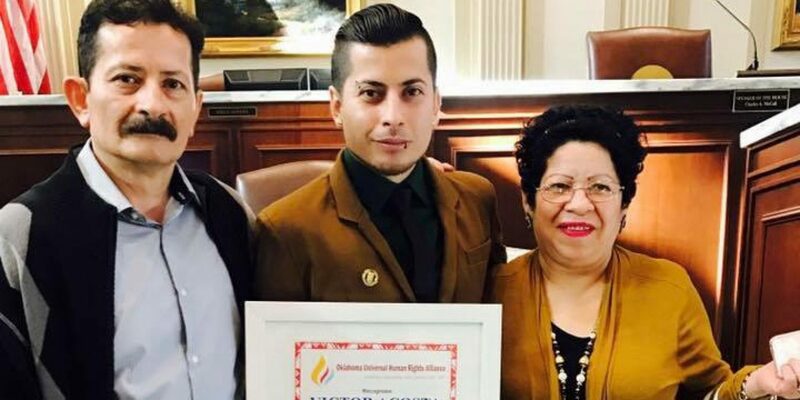 Acosta, pictured here alongside his parents, received the sixth annual Human Rights Award in 2017. Acosta has won several regional and national awards, including an ADDY in 2012, specifically for his work with paper as a medium. He earned the nickname “The Paper Master” during his time as a design student. He utilized paper as his main project material and brought his designs to life in a physical space. 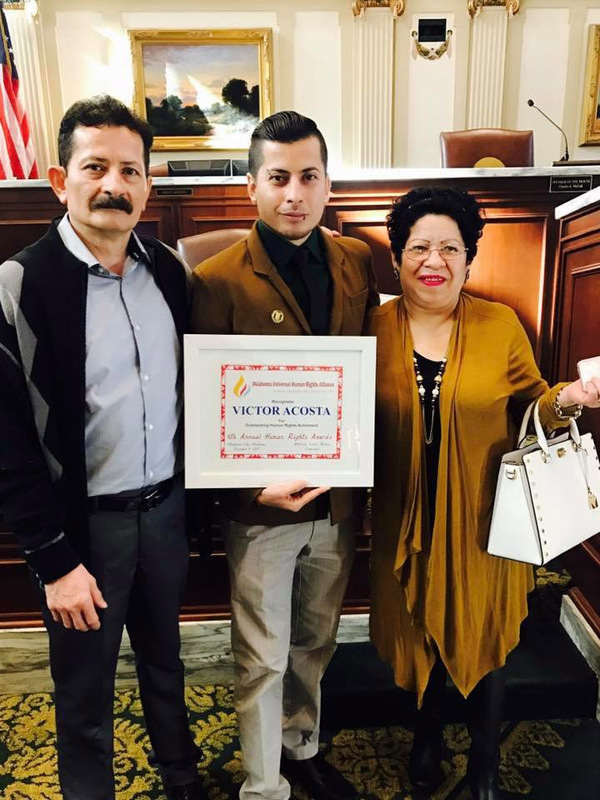 More recently, Acosta was named one of the 2017 NextGen Under 30 leaders and achievers in Oklahoma for his work in the arts and received the Outstanding Human Rights Achievement from the Oklahoma Universal Human Rights Alliance for his activism on behalf of human rights. Acosta currently works for the El Nacional newspaper in Oklahoma City and plans to go back to college for his master’s degree in the near future. He works on projects for community organizations, like the Global Experiences Foundation, and teaches basic computer skills for the Integris Learning Center. He also plans to create his own foundation for international students, providing both emotional and financial support. All Moved In? Now What?